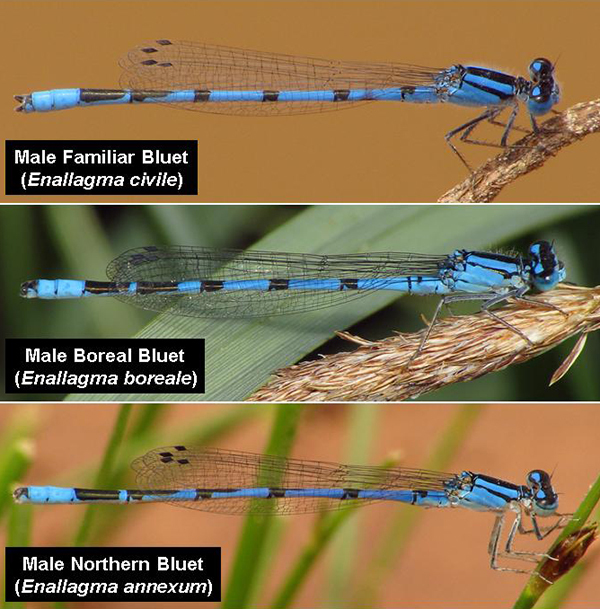 Three similar-looking bluet (Enallagma) species in Arizona are the Familiar (E. civile), Boreal (E. boreale), andNorthern (E. annexum) Bluets. Of these, the Familiar Bluet is most widespread, occurring in all counties and in a wide variety of habitats, and in some regions, flying year-round. By contrast, Boreal and Northern Bluets are limited roughly to the northeast half of the state (Paulson 2009; see distribution map of each species). Also note: The second abdominal segment (S2) in Familiar Bluet has a dorsal black spot that extends to the rear of the segment. By contrast, S2 in Boreal and Northern Bluets typically has a thin dorsal black line that does not touch the rear of the segment. However, the S2 spot in (some?) AZ populations of Northern Bluets is of the same shape and size as in typical Familiar Bluets (see pictures of each species). 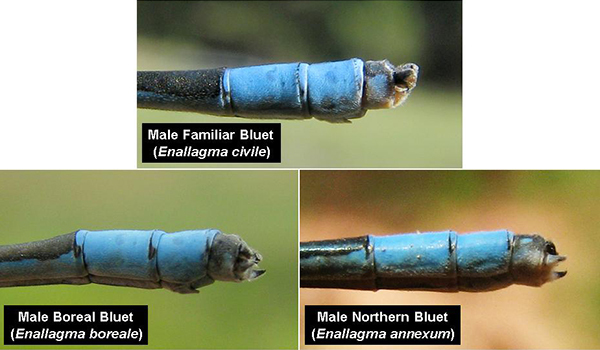 Lateral view of appendages of the Familiar (Enallagma civile), Boreal (E. boreale), and Northern (E. annexum) Bluets, AZ.